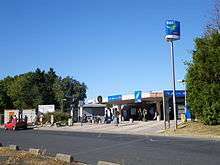 Villepinte is a station on the RER B's Airport branch. The station is located in Villepinte, a northern suburb of Paris, in Seine-Saint-Denis department, France. The station is in Zone 4 of the Carte orange. This is a list of stations of the RER rapid transit system in Paris, France. Note: Masséna station, located near to Boulevard Masséna, closed in December 2000 and was replaced by the Bibliothèque François Mitterrand station.